Based on the 1969 concept album by legendary British rock band The Who, Tommy tells the tale of a young boy who is so traumatised by an event he witnesses, and his mother's reaction to it, that he becomes deaf, dumb and blind. Understandably it's hard for him to function normally after that and matters are made worse by family members who take advantage of him. However, despite his severe limitations, there is one thing that he is incredibly good at: playing pinball. Even if you're not familiar with the musical or the album it's based on, you undoubtedly know the track Pinball Wizard, which is about Tommy's rise to fame and was sung by Elton John in the movie adaptation of the show in the 1970s. The production at Greenwich Theatre is a stripped-down version, which still retains its futuristic feel through the spot-on direction by Michael Strassen, a funky-looking design by Nik Corrall and the iconic sound created by The Who. The minimalist set both added to the innovative feel of the musical, as with something as simple as a rope they portrayed a house and an actual door to walk through, and it rightfully so put the actors' mesmerising stage presence in the spotlight – especially Ashley Birchall, who was phenomenal in the titular role. Tommy is an unlikely protagonist with limited capabilities to express his thoughts and feelings to the audience and in the wrong hands he could have easily been a weak and confusing character to focus on, however Birchall's understated performance was both powerful and immensely moving. There were other stand-outs in the cast too, such as Giovanni Spano as bully cousin Kevin and John Barr as the repulsive Uncle Ernie, who were particularly fantastic during their creepily cheerful duet Eyesight to the Blind, but this was really Birchall's show – and rightfully so. It was also a surprisingly physical performance from all involved with an exceptionally exciting and sometimes unexpected choreography by Mark Smith, which made the cast of 10 look far bigger than they truly were. However, for someone like myself who was not yet familiar with Tommy in any shape or form, the psychedelic show – which certainly matched the revolutionary time period it was created in – was sometimes a little hard to follow. Though due to the incredible performances, choreography, design and music, it looked and sounded so incredibly cool that I was sat watching in awe rather than continuously trying to figure out what was going on. It's very much a musical where you have to suspend disbelief and go with it, and if you are able to do that you'll be rewarded with an experience unlike any other you'll find in a London theatre. I'll leave you with the below video from the 1975 film and the urge to not be deaf, dumb or blind, but go to the fantastic production at Greenwich Theatre before it closes later this month. 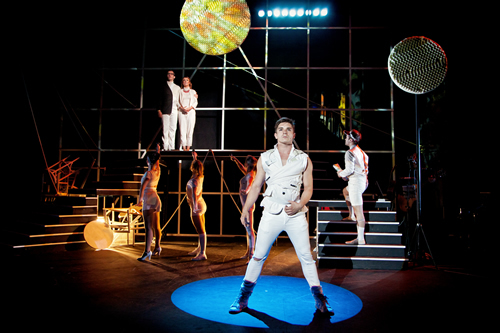 The Who's Tommy is running at Greenwich Theatre until 23 August 2015. You can book tickets here.